Radon is a radioactive, yet almost undetectable gas, because it rarely causes a chemical reaction when coming into contact with another substance, form, or matter. Despite its non-reactivity, it is dangerous to your health. According to data of Environmental Protection Agency, over 20,000 people die from radon a year. Radon is also the number two cause of lung cancer after smoking (Source). A radon test kit comes in real handy because radon is undetectable until that moment when the damage is irreparable. Radon is highly permeable, meaning you can never entirely get rid of it in your house or apartment. What you can do is use a kit to make sure your home is within a relatively safe range. The RD200 is designed with advanced technology, making it top choice on the market at present. This radon test kit is 20 times more sensitive than the average kit, making it highly accurate. Its dual structured mechanism with pulsed ions incorporates state of the art technology. This kit is really fast as well, relaying data in less than 60 minutes. The short testing period is very convenient, as are the data logging functions. The kit features graph displays for easy analysis, supports Bluetooth connectivity to smartphones, and has an alarm setting. Most radon kits on the market today will work best in certain spots, and the user needs to find out where they are for most effective results. One of the great things about this kit is that it gives accurate results irrespective of its location. 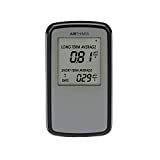 The Corentium Home Radon Detector by Airthings 223 is another great tool for detecting radon at home. You can read both short and long-term radon levels on the LCD screen. This kit is resistant to many different environmental and physical conditions including dust, weather, and electromagnetic interference. It is also battery operated. This kit gives accurate results and is easy to use. The fact that both short and long-term results are available allows users to make an informed decision. This product also makes it easy to interpret results, as users can see the readings through its LCD display. It has a long battery life and is highly portable. You can reset it as many times as you want to start another measurement once you’ve started using it. While a bit costly, this test kit is a highly precise, easy to use electronic device which will provide a realistic picture of both short and long term radon levels within your home. It is possible to get the averages over 24 hours, a week, or over the course of a full year. 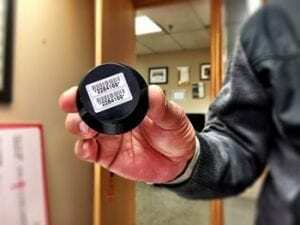 We think it’s great that you don’t need to wait a few days to get readings with this detector, which isn’t the case with most electronic detectors. The Accustar Alpha Track Test Kit is widely seen as one of the best radon test kits for detecting radon gas on your property. It filters out radon and dust via a structural filter, tracking the gas on the basis of diffusion. This kit features a hemispherical base designed to increase sensitivity and create steady track distribution for perfect counting statistics. It is also equipped with laser cut CR-39 sheets marked with unique numbers, each getting a calibration factor independently. It is easy to use this device, and it gives accurate test results. Users need to remove the kit from the sealed packaging before use and expose it in the air for several months. This period is sufficient to gather and establish the necessary radon concentration that would help provide essential statistics. This kit is top-rated by the US National Consumer Advocacy Group and EPA-certified as an effective radon detection tool. This kit detects radon long-term. Short-term tests are more precise and time-sensitive, but a long-term one is the better option if you’re looking for the big picture. This is crucial if you live in an area where radon is a frequently occurring problem considering the varying levels around the year. The kit is very easy to use. You just take the components out of the packaging and lay them out. When the results are ready, you send them to the lab (excellent customer service), and they’ll interpret them for you very swiftly. This is a basic, yet highly accurate short term test kit. Most users report that it gives them some peace of mind. The lab fee is included in the price, but you will have to pay postage upon sending the kit to the lab to get results. This fee is not big by any means. You can have your results rushed for an extra $10. One further consideration is that to get your results, the test kit has to reach the lab within ten days of dispatch. You would need to pay for priority mailing to ensure this. This kit is a great choice if you want to conduct a preliminary test before calling a professional in. It is within 8% of a professional’s readings on average, making it perfect for anyone who’s looking for a simple and basic testing device that will give a speedy reading of the radon levels in your home over several days. 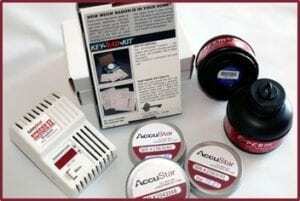 Our final choice is this radon detector kit, manufactured by Family Safety Products, Inc. This kit comes with a numeric LED display screen and performs a self-test every 24 hours. It is portable, easy to use and read. It meets US EPA performance criteria as well, making it perfect for detecting radon in your home. What is more, the test updates the air samples once an hour, aiding in enhancing the accuracy of the final readings, which increases the level of safety in your home. 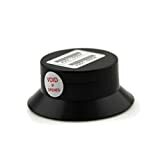 When using this particular digital radon detector, you also get short-term and long-term readings. The unit is electronic and mounted on the wall. We recommend it especially to people, who want to keep track of fluctuations all year round. This might be necessary if you’re trying to decide whether it’s time to install a mitigation system. The device is very accurate – some users even claim its results are as accurate as those of professional lab tests. It can give you some good pointers, but still, a professional will be best-able to decide whether you need a mitigation system or not. On the downside, the fact that it takes readings every day means it is not a device that detects radon in real time. It also emits an alarm signal if radon levels exceed 4.0, which is the limit for safe levels. This can get annoying since it will take some time to resolve the issue. All in all, we think this is a great detector to invest in if you’re looking for protection throughout the year that comes in a simple, easy to use format, and you can’t be bothered to send tests into a lab. There are several factors to take into account, given the sheer number of options there are to test for radon. Ideally, you’d get a well-priced, yet valuable product. Here are some tips on what to look for when buying a radon test kit. Ease of use is a top consideration. Most of the time, radon test kits require some technical knowledge, particularly if you want to understand the readings (see our section “how to use a radon test kit properly” below. What actually determines ease of use? Basically, it is the ability to use these products as needed and get accurate results. If you can’t use them properly, you would need to call a professional who understands various aspects of these tools. This can be very important as a way of increasing accuracy levels, especially when you need to detect passive radon. Accuracy is one of the most crucial elements to look for in a radon test kit. We recommend long-term radon test kits because they are able to give the big picture. This is due to the fact that they can test over an extended period of time. It becomes easy to give an overview in terms of different seasons and weather. Alternatively, short-term radon detectors offer a rough estimate of what the radon levels in your area are. Inaccuracy in these kits can be caused by user errors as well. Thus, it is important to read and follow the instructions on the manual carefully in order to avoid such inaccuracies. The price of a digital radon detector is a significant aspect to consider. It is also important to know what features are taken into account in the price formation. Should you be looking for a test kit that offers basic short-term readings, the charcoal kit is probably the most suitable one. 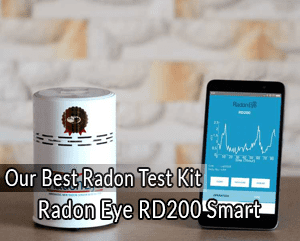 These kits are affordable and simple to use and they give reliable, short-term results, making it easy to solve your radon detection needs within a brief time frame. Of course, long-term radon test kits cost more, but the quality and features more than make up for this. Easy installation is another important factor that you have to take into account when picking the best radon test kit. The complexity of installation varies depending on the particular type. These kits often come with user manuals that make it possible for them to be installed accordingly for best results. We recommend contacting an expert to help you with the installation so as to avoid compromising on safety. It would be best to set the radon detector in the lowest area of the house. As the gas is quite dense, it will sink to the floor more often than not. The placement of your kit is important too. Ideally, it would be placed around 40 inches from the floor (on average). If you have a basement, you should place the kit there. On the other hand, radon in a crawlspace is best detected in the room directly above. If you have several different foundation types, you will need more than one kit. For a single foundation, almost any room will do, and you just need one kit as long as you follow some extra guidelines. You can limit much of the risk that radon poses with the right kit. To be able to do this, you need to know the actual levels in your home. We hope this guide has helped and you’ve found our list of the 5 best radon test kits in 2018 useful. Each of the products reviewed here will go a long way toward protecting your health. Please share your experience with them in the comments section below.